Our series profiling the next generation of special collections librarians and curators continues today with Allison Jai O’Dell, Special Collections Cataloging and Metadata Librarian at the University of Miami. By following sage advice. My undergraduate degrees were in ancient history and classical languages. This educational path doesn’t often translate into a ready (let alone lucrative) career, so I went to work as a database administrator. I quickly became enamored of information management and enrolled in library school at The Catholic University of America. During the first months of my MLS program, everyone kept saying, “You know Latin and Greek? Have you thought about rare books?” So, I heeded their collective recommendation and registered for courses on book history and rare books librarianship. Being trained in archaeological methodology, exploring book history felt natural to me. Something clicked: this was the perfect way to combine my academic background and professional experience. I serve as the Special Collections Cataloging and Metadata Librarian for the University of Miami Libraries. Practically speaking, I am involved in all things that relate to facilitating intellectual access to print and manuscript materials in our special collections. My duties include “traditional” rare book cataloging, metadata management, policy development, and collaborative work with the systems and web development teams to build better user experiences. I am fortunate to work with future-focused colleagues who are creatively reconsidering the habits of twenty-first-century information consumers. Lately, I have been facilitating usability studies to improve and invent front-end interfaces, coordinating library-wide discussions to address implementation of linked data features and open metadata strategies, and investigating possibilities available in new systems and schemas. And naturally, I take pictures and blog. I adore Melissa Jay Craig’s work. She engages with book aesthetics and book form through the corporeal nature of handmade paper, and she creates conversations about the experience of reading in the absence of textual content. Finding “Working Philosophy” at the Jaffe Center for Book Arts was definitely my favorite book-object experience. My apartment is full of prints, books, and textiles made by friends and colleagues. I keep them for their sentimental value - because I know the stories behind their creation, I respect the labor involved in making, and I’m fond of their makers. But I don’t endeavor to be a collector. I live with two house rabbits who frequently make snacks out of works on paper. My home isn’t the most appropriate space for stewarding artifacts into future use. I love being employed in the study of material culture. Everyday objects, such as books and ephemera, are a record of who we are, what we do, and what we want. I’m fascinated by the anthropological aspects of my career. I see an increasingly exhibition-heavy role for special collections and rare book libraries. A few days ago, I was explaining my job to a new friend. I said that I work to help users access the information in our catalogs and databases. Her response was, “So, you make infographics?” I laughed, but it was a very telling moment. The public assumes that information professionals will curate information for them, and services that distill content into a meaningful and digestible product appear attractive. Besides, audiences expect museum-like programming when we promote the artifactual value of our material. Graphic displays and narrative formats have the power to extract and present knowledge, and we can harness this capacity through exhibits, blogs, data visualizations - and yes, infographics. I also envision research analyst positions growing among the special collections workforce. We train as researchers in book and human history; we become intimately familiar with our collections and their descriptive metadata; we cultivate strengths in investigative methodologies and data mining techniques - and yet, we typically stop short of performing research services ourselves. In an age of information obesity, and given the potential for collaboration available in the digital humanities, I think that might change. The Jackie Gleason Collection focuses on parapsychology, including both scholarly and popular works in areas such as occultism, reincarnation, hypnotism, UFOs, ghosts, spiritual healing, demonology, magic, telepathy, astral projection, clairvoyance... really, really cool stuff. Our Artists’ Books Collection is what drew me to the University of Miami. It’s a top-notch representation of the genre and highly regarded among contemporary artists. I was surprised to discover that our zine collections are both quite substantial and fully described. They provide amazing primary source material for researching political, social, sexual, and musical subcultures of the latter 20th century. The Firefly Zine Collection was donated by former residents of the Firefly, a local Miami collective house and important part of Miami’s punk rock and activist scene. Golly, lots! “?#@*$%! the Mainstream: The Art of DIY Self Expression,” which ran at the University of Miami Lowe Art Museum this past winter, will be seeing a reprise at the Otto G. Richter Library in the coming year. Our Special Collections Division is working on an exhibit showcasing local culinary culture. (Being a cultural melting pot with indigenous tropical fruits, Miami is a great place for chow!) The Cuban Heritage Collection (CHC) is a partner in bringing the Guantanamo Public Memory Project to the University of Miami in October. And the CHC’s fall 2014 exhibition will be on Manuel Ochoa, founder of the Miami Symphony Orchestra. 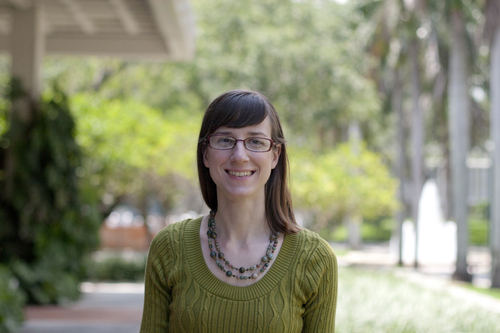 Our series profiling the next generation of special collections librarians and curators continues today with Allison Jai O'Dell, Special Collections Cataloging and Metadata Librarian at the University of Miami. By following sage advice. My undergraduate degrees were in ancient history and classical languages. This educational path doesn't often translate into a ready (let alone lucrative) career, so I went to work as a database administrator. I quickly became enamored of information management and enrolled in library school at The Catholic University of America. During the first months of my MLS program, everyone kept saying, "You know Latin and Greek? Have you thought about rare books?" So, I heeded their collective recommendation and registered for courses on book history and rare books librarianship. Being trained in archaeological methodology, exploring book history felt natural to me. Something clicked: this was the perfect way to combine my academic background and professional experience. Once I immersed myself in rare book cataloging, it became clear that to do the work justice, I was going to have to learn to reverse engineer a book artifact. That is, I was going to have to learn to make books. I enrolled in the Corcoran College of Art and Design's M.A. program in "Art and the Book." Studio practice in printmaking, typography, layout design, binding, and papermaking offered a foundation for assessing the products of these activities that has proved invaluable in describing and arranging them. I draw upon my knowledge of the book arts constantly in my work, and always refer new professionals to Kathleen Walkup's essay, "Why Book Arts Matter." I serve as the Special Collections Cataloging and Metadata Librarian for the University of Miami Libraries. Practically speaking, I am involved in all things that relate to facilitating intellectual access to print and manuscript materials in our special collections. My duties include "traditional" rare book cataloging, metadata management, policy development, and collaborative work with the systems and web development teams to build better user experiences. I adore Melissa Jay Craig's work. She engages with book aesthetics and book form through the corporeal nature of handmade paper, and she creates conversations about the experience of reading in the absence of textual content. Finding "Working Philosophy" at the Jaffe Center for Book Arts was definitely my favorite book-object experience. My apartment is full of prints, books, and textiles made by friends and colleagues. I keep them for their sentimental value - because I know the stories behind their creation, I respect the labor involved in making, and I'm fond of their makers. But I don't endeavor to be a collector. I live with two house rabbits who frequently make snacks out of works on paper. My home isn't the most appropriate space for stewarding artifacts into future use. I love being employed in the study of material culture. Everyday objects, such as books and ephemera, are a record of who we are, what we do, and what we want. I'm fascinated by the anthropological aspects of my career. I see an increasingly exhibition-heavy role for special collections and rare book libraries. A few days ago, I was explaining my job to a new friend. I said that I work to help users access the information in our catalogs and databases. Her response was, "So, you make infographics?" I laughed, but it was a very telling moment. The public assumes that information professionals will curate information for them, and services that distill content into a meaningful and digestible product appear attractive. Besides, audiences expect museum-like programming when we promote the artifactual value of our material. Graphic displays and narrative formats have the power to extract and present knowledge, and we can harness this capacity through exhibits, blogs, data visualizations - and yes, infographics. Our Artists' Books Collection is what drew me to the University of Miami. It's a top-notch representation of the genre and highly regarded among contemporary artists. I was surprised to discover that our zine collections are both quite substantial and fully described. They provide amazing primary source material for researching political, social, sexual, and musical subcultures of the latter 20th century. The Firefly Zine Collection was donated by former residents of the Firefly, a local Miami collective house and important part of Miami's punk rock and activist scene. Golly, lots! "?#@*$%! the Mainstream: The Art of DIY Self Expression," which ran at the University of Miami Lowe Art Museum this past winter, will be seeing a reprise at the Otto G. Richter Library in the coming year. Our Special Collections Division is working on an exhibit showcasing local culinary culture. (Being a cultural melting pot with indigenous tropical fruits, Miami is a great place for chow!) The Cuban Heritage Collection (CHC) is a partner in bringing the Guantanamo Public Memory Project to the University of Miami in October. And the CHC's fall 2014 exhibition will be on Manuel Ochoa, founder of the Miami Symphony Orchestra.